Dear Reader, you are looking at what may be my favourite picture ever. No, it’s not nice — but *I* didn’t carve it. Your question: Where is this particular chunk o’ granite located? And for the smarty pants among you, who is it? I don’t actually know the answer to the latter question but I have an idea. And some smarty out there will be sure to tell us who! At Notre Dame. 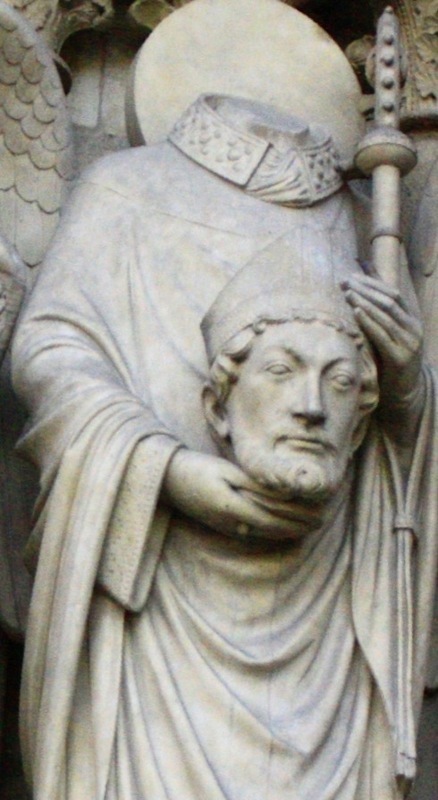 Saint Denis – the first Bishop of Paris. Tortured by Roman soldiers and killed 273AD. Decapitated by the Romans on the slopes of Montmartre – said to have picked up his head and walked the four miles to the site of Notre Dame. Collapsed at the site where the cathedral stands today. Do I win? A trip to Paris? Were you one of those good little girls who sat in the front row and got all the answers right? Did you wear a tunic? Braids? Glasses? Or were you one of those gum-cracking, black eyeliner’d girls who slouched at the back of the class, with the boys, and got all the answers right? And handed in her homework late? And was told she could do better if only she applied herself? In any case, well done. And thanks for the research. I figured the poor sod was a bishop, given his mitre (fancy hat) but you win the smarty pants prize for sure. A bag of herbes de Provence will be on your doorstep in one week! B, But without the boys and the gum.